Episode Three, Hereafter Known as "In Which I Really Love Haru". 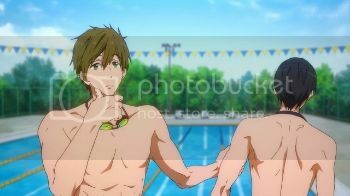 Oh, Haru-chan, we are the same, aren't we? Except I'm not actually good at anything. I'm guessing this was Gou's idea. Not so fast, young man. If last season was based on Rin's character arc (and man, is it weird seeing Rin so calm and normal now), then I guess this will be about Haru's future--we've already had three conversations in three episodes about what Haru's going to do. He just wants to swim, people. I loved that he acknowledged what Rei had done for him and Rin. Take that, New Guy--you really don't know what's been happening around here. omg, when will Gou and Nagisa realize how similar they are and how adorable they'd be? And Gou's characterization was much stronger in this episode. Thank you for that. and omg, Rin-Rei friendship is the greatest thing. 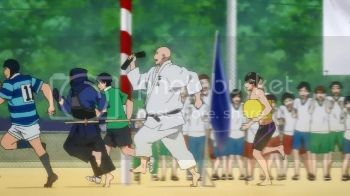 I'd figured out Rei was practicing in secret but not where (I thought maybe Sasabe was covering for him? ), so when this was revealed I just said, "I love this show SO MUCH!" 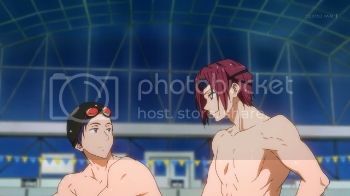 Oh, gosh, and there's no good non-pervy cap for it, but when Mikoshiba Jr was checking out Rin's chest and Rin was all, "Dude, my eyes are up here", I just lost it. A Rei episode! Animators really upped their game with the comedic facial expressions this episode. 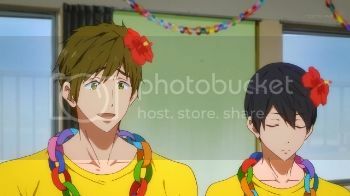 I don't remember Haru putting together such a long speech as when everyone gathered to convince Rei not to leave the club. I was shocked. The cookies are from Rei... poor Mikoshiba Jr. That's just too cruel. Also, producers trying too hard early on the episode: "I remember you preferred the bottom, right?" You know who gets paired with Gou a lot? Makoto. I guess the size-difference is cute? The fact that he could lift her with one arm... Mreh. 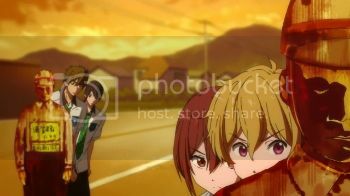 What are the odds that Gou will get in the pool this season? Heck, she might be the best swimmer by a mile; would make a good one-shot: "Do I have your attention now?" I think I read Gou is not supposed to be athletic, because they wanted her to be different than Rin. That's part of the new thing I started writing but probably won't finish, because I never finish anything.